following via GFC and bloglovin'! Ooh I had been admiring those shoes! Giving it a shot. I'm Laura at lauradaeger@gmail.com. Your default pic reminded me of Snow White, the old fairy tale book version, not the Disney version. That was supposed to be a complement. The only sandals that should be allowed with socks! I love this outfit! The blouse is adorable - and the heels look super comfy. My name is Sherrie Atkins, I have never owned a pair of Blowfish shoes! I would love to win a pair of them, they look soo comfortable!! They look so good on you I do not have an E-mail, I hope i can still win!! Probally not, but I tried!! Address: Sherrie Atkins 894 Limekiln Rd. Erin, Tenn. 37061 I haven't found out hoe to blog, but I am going to try so I can win these Shoes!! They are soo cool looking!! I'm a follower via Google friend connect and Bloglovin'. Oh, I also liked the Facebook page, and followed the Twitter! Im following through google but i dont use bloglovin .. hopefully thats ok.
Love love blowfish! I follow you through Google/Bloglovin. They are really lovely. I would love to win them:) I follow through google and bloglovin. My name's Yaminah. Those shoes are so cute!! My name is Ruthie, email is ruthelaine17@yahoo.com ! eesh i love them, i actually saw these on another blog too and swooned a little, totally cute. simonerobert_@hotmail.ca, I follow with Google and I am in love with your blog forever. The shoes are beautiful, I caved in. I love this! Amazing. The shoes are to die for, and I ADORE your blog! following on bloglovin and GFC! I love Blowfish! These shoes are fabulous. I love the cork bottom. I've been eying these shoes! Ooh awesome, I just bought the Garren platforms and they are amazing! Would love to have these in black! Ooooh, this is an AMAAAZING giveaway! awesome! i have been dying over these recently. i already follow on bloglovin'! and i liked on facebook! aww i am in love with these! pick me! pick me! haha. love your outfit, absolutely lovely! I was just about to comment on how much I love those shoes and the I saw your giveaway! Count me in on this great giveaway! A girl needs a good pair of heels to wear with socks. Oh - I've had my eye on those shoes! I'd love to win. I follow you on blog lovin' and google. I am a fan of Flashes of Style and Blowfish on Facebook. I shared with over 40 friends on Facebook. I don't use blog lovin' but I follow you on google. I hope this still works. i have been pining for these babies! These shoes and your blog are awesome. The collar and bow on your shirt is so cute! I adore this entire outfit! 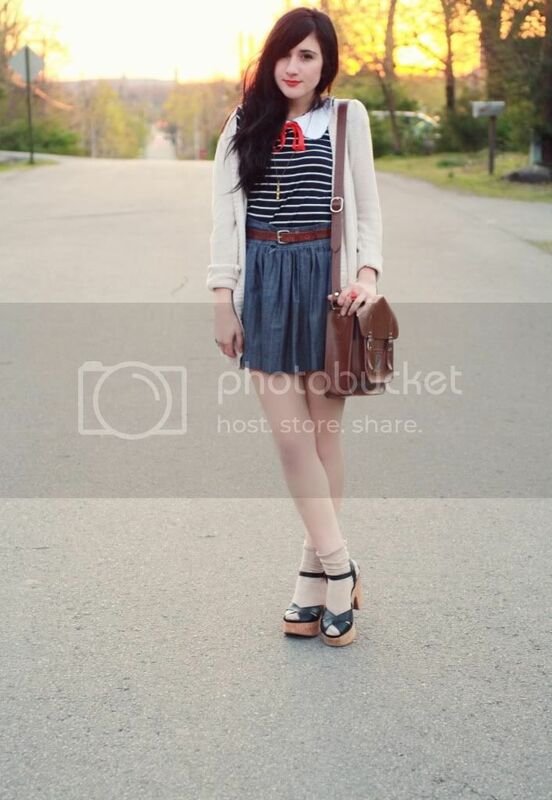 You look like a cute little sailor girl :). I would love a pair of those wedges! I love Blowfish shoes! I'm going to buy myself two pairs once I give birth! Following you on google and bloglovin now! They are adorable! Me, please! Ahh! I'm following you on twitter and on Bloglovin! Oh my god!!! it's so cute. I hope I could wear it for my prom night. You look like Snow-white princess. Your skin tone, hair, lips.. And your today clothes in dark blue, white and bit of red made it totally awesome. Ok, I'm trying my luck with this too... but first of all, you look delightful in those pictures! So cute with that red ribbon! I am newly obsessed with platforms, and holy guacamole, these are PERFECT! Would adore owning them!! I follow you on GFC and Bloglovin, and I definitely follow Blowfish on FB and Twitter- love their shoes!! I love your outfit, as always! ps: love your outfit! 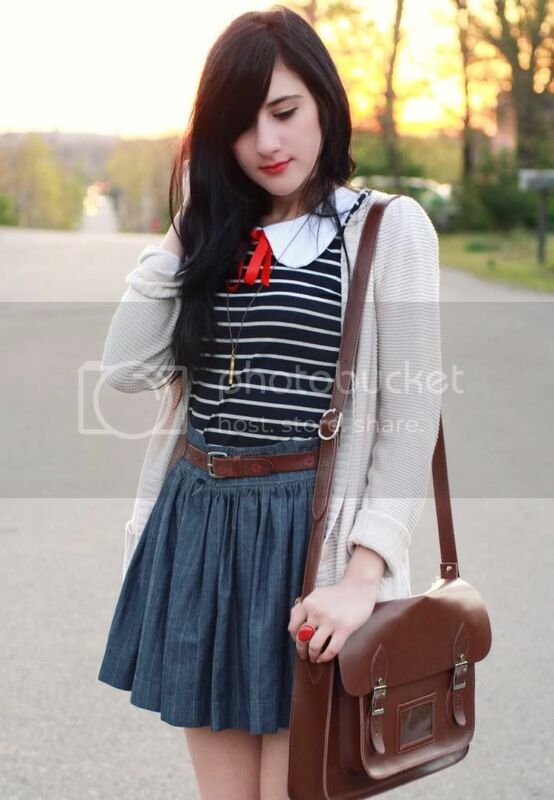 i'm a big fan of your bag n_n also like the red details! i follow you on bloglovin and on google :) and im siper poor and have no fashion sense then reading your blog regliously..pick me please....carolineadams95@gmail.com i want the BLACK pair <3 thanks!!! they look great with socks! Wowza they are some good looking shoes! I think i have that peter pan collar top but in burgundy or maybe its a diffrent one. Gorgoues! I'll be very happy if you have a look at my photoblog! Your style is perfect as always!! 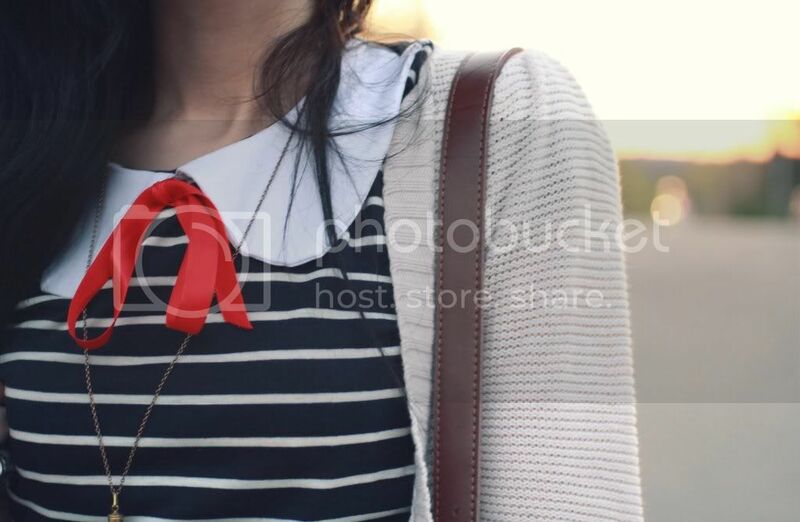 i love the detail of red bow in the tee. ooo! I hope I win! they look so cute on you! Love the shoes. I follow through google!! Love the look! The brown belt is such a brilliant detail and the bow too of course! cute (: i'm also hosting a giveaway. i hope you check it out! Thank you for such a fabulous giveaway to everyone all over! I'm Holly. I follow via GFC. Yay! follower on both bloglovin and here! lovin' the shoes! wedges summer love! the shoes are too cute! I've seen those shoes in many blogs and all of you agree that are comfortable! So I cant wait to win them..
Also the shoes are BEAUTIFUL! Yes, please! I love blowfish shoes. So pretty. You look super cute! really love your style..
Woohee what a fantastic giveaway! i love your dress <3. i follow through bloglovin and GFC! cute shoes! love to have the black! followed through google, been a fan on lookbook a while already. you have very lovely styles! oh yay! I follow you through Bloglovin'. And I follow Blowfish on twitter. Following you on bloglovin, those shoes are too cute. Obsessed. I am now following you. Thanks for the chance to win. xo. your outfits are always so pretty - just awesome!! those are perfect for spring and summer! HI i love the way you dress your self so inspired by your looks very awsome ive been following your blogs my name is Toni email at toni_5150@hotmail.com . Followed you on bloglovin already, but just started following your twitter! I will love to win the black ones! For contest entry, I'd be thrilled to get so lucky! those shoes are super cute, thanks again for the giveaway!!!! I am a brand new follower (I found your blog today) and love your site!! You are one beauty! Aw I'd love to win these Bonnie! I follow you via GFC and bloglovin of course, and also blowfish on twitter. PS: You look gorgeous in this look, the little red bow is the perfect touch! Following you on google and bloglovin and Blowfish too..